They don’t make women like Wanda Jackson anymore. The Queen of Rockabilly was told early in her career by producer Ken Nelson that “girls don’t sell records.” But that didn’t deter her from an illustrious career playing along side of Buck Owens, Roy Clark, Big Al Downing, and touring with Elvis Presley. 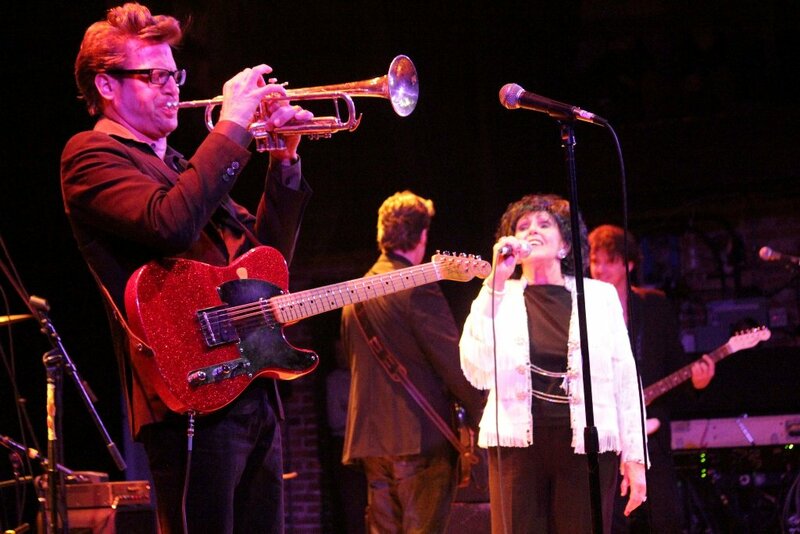 After a string of top 40 hits in the country and rockabilly realm, a syndicated television show, a Grammy Nomination, and inductions into both the Rockabilly Hall of Fame and the Rock and Roll Hall of Fame, Jackson continues her legacy with a new album released in 2011, and a subsequent “never ending world tour,” which brings us to Friday evening at the Boulder Theater. Standing shy of the five foot mark and clad in a white fringed jacket, with her backing band seemingly towering over her, Jackson is an absolute fireball, a very charming and professional fireball. When Jack White (of The White Stripes, The Raconteurs and The Dead Weather fame) coaxed her back into the recording studio in 2009 to begin recording what came to be The Party Ain’t Over, he obviously had a vision. Known for her feisty character, Jackson (now 73 years young) still conveys such qualities in her stage show. Despite a vocal hiccup or two during her 1961 number “Funnel of Love,” she commanded her audience, backed up by the Rockabilly sound of Seattle’s Dusty 45s. Pumping her fist, wailing and howling through her classics and some recent numbers, she reminded everyone that she witnessed the birth of what came to be Rock and Roll, and is still willing to carry the torch. Jackson interspersed early hits “Riot in Cell Block #9,” “Fujiyama Mama” and “Let’s Have a Party” and covers of “You Know I’m No Good” by Amy Winehouse and Jerry Lee Lewis’s “Whole Lotta Shakin’ Goin’ On,” with delightfully amusing tales of her musical career. She spoke of her early days as a country singer when Presley encouraged her to play Rockabilly music (which at that point was simply referred to as “Elvis’s music”) and paid tribute with her rendition of “Heartbreak Hotel.” She continued her story, recalling the time Presley invited her into his room where he played records for her, and how later, upon being asked what he played for her, admitted that she couldn’t remember, as she was too enamored merely being in the presence of the King of Rock and Roll. Although a pretty cruel April Fool’s Day rumor that White would be sitting in with Jackson for the night’s performance didn’t end up materializing, the audience nonetheless cut up the rug with 50s style dance and sung along with the legendary Queen. Jackson is a living piece of music history, and her choice to press on and continue gracing audiences with her presence is a true blessing to the music world. Check out more photos from the show and some videos as well. You can learn more about Wanda Jackson through her website as well as more on the Dusty 45's on their website.